In our last blog, I told you how to shop for my hands-down favorite holiday meat centerpiece—the hulking, glistening, spice-blasted, smoke-scented, crusty-on-the- outside, moist-meaty-rare-on-the-inside, bone-in, carnivorous nirvana known as prime rib. This week, we’ll focus on how to prep and cook a prime rib. It’s easy, but as with so much in life, perfection lies in the details. As always, the action takes place on your grill or in your smoker outdoors. No oven allowed. So put on your overcoat and let’s get to work. Lay the roast on a cutting board meat side up. Using a sharp knife, cut through the fat cap straight down to the rack of bones, then come in through the side, your knife parallel to the bones, until you intersect your first cut. (For photos, see page 33 of How to Grill.) Remove the resulting fatty wedge. Next, cut out the pieces of meat between the ends of the ribs. (Roast these alongside the prime rib so you’ll have drippings for Yorkshire pudding. Use a small sharp paring knife to thoroughly scrape the bones clean. Finally, trim the remaining fat covering the roast to a thickness of 1/2 inch. Bind and dominate: Prime rib has naturally-occurring lines of fat that divide the “eye” of the muscle from the spinalis dorsi, commonly known as the cap. Tying the roast with butcher’s string between the bones (bone-in roast) or at 1-1/2 inch intervals (boneless roast) will discourage separation along these natural fault lines as the meat cooks. It will not only be easier to carve, but will make a more professional-looking presentation on the plate. Season like you mean it: When the meat is this good, you can get by seasoning it simply but liberally with coarse salt (kosher or sea) and coarse, freshly ground black pepper. Sometimes being of the “more is more” school of thought, I like to mix up a quick rub consisting of 2 teaspoons each of coarse or hickory-smoked salt, dried rosemary, onion salt, garlic salt, dried rosemary, and black pepper. Apply the rub just before cooking. Up in smoke: There are many ways to cook a prime rib: indirect grilling, spit-roasting, in a smoker … and we’ll cover them in a blog post next week. However you do it, a blast of hardwood smoke can make an excellent prime rib even better. I’m partial to the clean flavor of oak, but hickory and cherry are good options, too. (Mesquite is a little strong.) Soak the chips for 30 minutes in water to cover, then drain before tossing them on the coals, or placing them in your grill’s smoker box. Do you need some inspiration about what to slather on your prime rib? Try some of these homemade rubs. 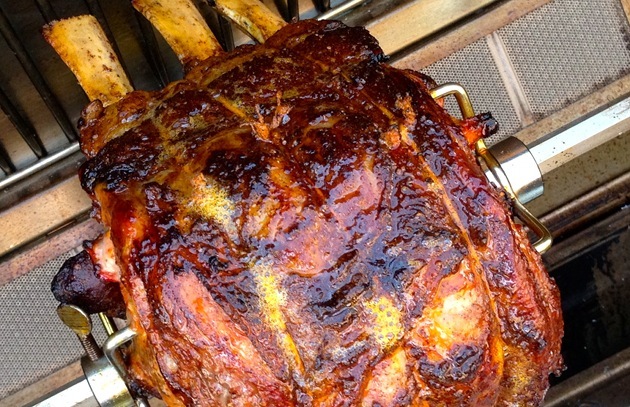 Share your own ideas, recipes, and photos on the Barbecue Board. If you missed last week’s post about prime rib, be sure to check out those tips to help you buy the best piece of meat.